The build-up of political tension as next year's general elections loom large has led to a flare-up of communal violence in India's largest electoral battleground, Uttar Pradesh. A little further back but from recent memory, one can also recall instances of rioting between communities in Assam and of course, the chronically vulnerable state of Jammu and Kashmir. The thread of communal harmony which seems to have become increasingly taut and susceptible to tear with time naturally raises the question if the much-talked about Indian secularism is only a mirage. Satarupa: While we are tempted to start the discussion in reference to the most recent riots in UP, let me stand back and start at a broader level. What do you think the term 'Secularism' really stands for in common Indian imagination? Ram Guha: Caste is a more complex issue. But let's just talk about relationships between religions, primarily between Hindus and Muslims, but also between Hindus and other communities. Hindus are a majority in our country. They have demographic and numerical majority. Yet, because we are a large country, although the proportion of Muslim population is small, India has the third or fourth largest Muslim population in the world after Indonesia, Bangladesh and Pakistan. With such a large minority, it is obligatory for the majority to recognise its limits and responsibilities. Of course, the minorities also have their responsibilities but the majority has a greater responsibility. In my view, in India in particular, Hindu fundamentalism poses a greater danger than Islam fundamentalism. In the world at large, it is just the reverse. Islamic fundamentalism is causing terrorism in many parts of the world. But in India, simply because we Hindus form such a vast majority, we pose the gravest danger and this is borne out by studies of communal riots everywhere, except for Kashmir. In Kashmir, the Hindus were persecuted, the Pandits had to flee and the violence was largely against them. But in every other state, Maharashtra, Gujarat, UP, Muslims have suffered much more in proportional terms. More Muslims are killed, even though they are fewer in numbers; more Muslim houses are burnt. These are the cold facts revealed by dozens of scholarly studies down the decades. It is a real obligation and responsibility on Hindus not to be seduced by fundamentalism or by talk of supremacy or by the idea that India is a Hindu Rashtra. Pakistan may be an Islamic Republic but India is not a Hindu state and the only way it can survive is by affirming its commitment to religious pluralism and inclusiveness. Subramaniam: You have quoted Hamid Dalwai in Makers of Modern India. There is an interesting paragraph where he writes that to even call Hindus a majority and Muslims a minority reflects a non-secular attitude in this country. And yet in public discourse today, there is always talk of who is majority and who is minority and whose responsibilities are what. Isn't Dalwai's a deeper take on what secularism in a democracy should be about? In the case of the Muzaffarnagar riots, although inflammatory speeches were made by the BJP and the VHP, clearly the main responsibility lies with the Samajwadi party because they were in power and they couldn't stop it. From my personal experience, I can say that if the state acts, rioting can be stopped. And there are examples to prove that. In our home state of Karnataka, in the 1990s the Sangh Parivar wanted to make the Baba Budangiri hills a second Ayodhya. There are both Muslim and Hindu shrines on a hill. The Parivar wanted to erase the Muslim shrine and make it a second Ayodhya. J H Patel was the socialist Chief Minister at that time. He may not have been a good CM in any other respect but was so committed to communal harmony that he sent 10,000 policemen to the site and nothing happened. It is rare because our political class is known for being short sighted, for being instrumental and only looking at how to win the next elections, a few exceptions apart, one of whom was Jawaharlal Nehru. One of the greatest, underrated achievements of Nehru's time was that between 1947 and 1963 there were no major Hindu-Muslim riots. Another factor comes from a regional trend of the times, which was one of rising Islamic fundamentalism. The Hindus were emboldened to say, if Pakistan is a Muslim homeland why can't we also be a Hindu homeland? People like Ashok Singhal of Vishwa Hindu Parishad have explicitly said that Muslims and Christians should be second class citizens in India just as Hindus and Sikhs are second class citizens in Pakistan. So, that presents the regional context. The other factor in India is the decline of the Congress party. The Congress party of today is not the one during Nehru's time. It is short sighted, opportunistic; it is a dynasty, it is corrupt. The manifest failures of the Congress party have made many people willing to overlook the radical Hindutva of the BJP. Subramaniam: You have always insisted, in writing as well as quotes to other media, that Indian pluralism is a hard-won. Why do you even say it is "won"? Ram Guha: It was hard-won and it will continue to be hard-won. To refer back to a formulation that I used in India After Gandhi, if Indian democracy is 50-50, then Indian pluralism is also 50-50. But we haven't broken up or become a Hindu state yet. Even the BJP is obliged to say that they believe in "positive" secularism. It may be tokenism but they are also seen trying to reach out to the minority communities now. So, most of India is not scarred by religious fundamentalism. We haven't gone down the Pakistani route . we have Hindus and Muslims and Christians and Buddhists in public life; we haven't had continuous riots all across India. But maybe it is not absolutely "won" yet; I agree it is still in the process of being secured. Maybe one can say it was hard-won in the 1940s when Nehru and Gandhi insisted that India would not be a Hindu Pakistan. It was a famous speech that Gandhi gave in 1947 where he said that the Congress always stood for all of India irrespective of language, caste, gender or religion and that's how it must always be. That is how we did not descend along the slippery slope. Some people think that Gandhi's martyrdom shocked Hindus so much that they retreated from their radical faiths and came to their senses. But it is also true that the creation of Pakistan as a Muslim homeland gave a spur, an encouragement, an incitement and an opportunity to radical Hindu groups. I always say that as long as there is Pakistan, there will be Hindutva in India. In times of crisis, this Hindutva will be strong and aggressive, in times of calm, it will be recessive and on the margin. But as long as we have a state on the borders that has committed itself to being an Islamic republic, there will be Hindus who say, "Hum bhi aisa karenge." These are the ways in which our pluralism will always be fragile, difficult to secure and hence, we can never take it for granted. The conceit that a decade of economic growth will remove the threat of religious fundamentalism is misplaced. Subramaniam: If you say 'hard-won' again, who would do you say is winning? Ram Guha: You see, we need peace and security. One place where it has been won is Bombay. After the 1992-93 riots, there were these Mohalla Committees which were set up. People worked consistently to rebuild trust between Hindus and Muslims. And when the terrorists from Pakistan attacked Mumbai in 2008, one of the objectives was to spark a pogrom against Muslims and that didn't happen. 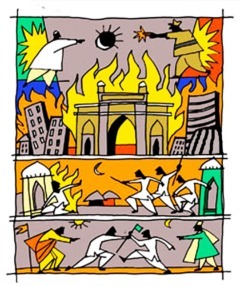 Bombay which had regular riots in the 80s and 90s has been regularly peaceful over the last 20 years because of vigilant and focussed work. That's the kind of work we need in a sustained way and we need media also to play a role. It requires a great deal of responsible reporting by the media, steady and patient action by citizens to build or rebuild trust and above all it requires courageous and decisive political leadership, which is what was lacking in UP. Subramaniam: Yes, for example, you categorise Bala Gangadhar Tilak as a militant nationalist whose views were pro-Swaraj and pro-Hindu and may have alienated Muslims. Yet he was also defended by Muhammad Ali Jinnah. How do you see Tilak's brand of nationalism playing out today? Ram Guha: I think it is difficult to say...he could have moderated his views as many people have. One can't really say how Tilak would have acted now. But we can invoke Nehru or Gandhi - one can look at what Gandhi did after independence. What he did in Delhi and Calcutta and what he intended to do in Punjab was the same. It was to restore trust and faith and inter-communal harmony. Satarupa: Since you talk about the divisive vocabulary and hatred on Twitter, it shows that the weak or manipulative leadership is still being able to create this level of distrust among the people, and ultimately the responsibility for harmony lies with the people as well. The fact that politicians are still able to polarise the people and lead to actual violent incidents on the ground, what hopes does that hold for the inclusive ideal that the nation's makers referred to? Ram Guha: You see, it is a disaggregated process. India is a large country of 28-29 states and operates at different levels. Each state goes at its own pace. The worrying part is UP, it's very large. It has a large and insecure Muslim population. It has economic problems, lack of employment opportunities. In Bihar too, there are similar problems but Nitish Kumar is very focussed on this and he will hopefully carry on. But it is not so bad in the South, for example in Karnataka, Tamilnadu or Kerala, or even in Bombay, as I explained. Subramaniam: Why is it that peacemaking capacity or secularism has not played a role in the competitive politics of our democracy? Parties are also supposed to seize peacemaking opportunities to stand and say, 'Look I stand for peace and you can vote for me.' Why hasn't that happened across the parties? The BJP has always been committed to Hindutva. They had a lot of opportunities in the past to distance themselves from the RSS and they have not done it. Now the RSS has come back in full flow. It is an insular, bigoted, chauvinistic narrow minded form of politics. The RSS's ideas basically mirror those of the Mullahs and the Pakistanis. The only difference is that the Hindus will be in charge here and the Muslims there. And of course, in the Congress no one has the courage. If Rajiv Gandhi had not reversed the Shah Bano judgment and provided for uniform, gender-sensitive civil codes, things could have been different. Rahul Gandhi and Sonia Gandhi can't really rise to it. But the one good thing is that the ordinary common sense of the people in the country is against communal riots, which is why in Kerala, Karnataka and Bombay you have seen the build-up of trust over time and abhorrence to violence. Ram Guha: I think the Shah Bano judgment could certainly have. And then there is Advani's Rath Yatra. There is a big debate over 1984 Delhi and 2002 Gujarat. The BJP demonises Rajiv Gandhi while the Congress demonises Modi. But in many ways, the real culprit was Advani. Advani's Rath yatra was deliberately aimed at polarising Hindus and Muslims. So those two are indeed responsible for present realities - Advani for promoting his Rath Yatra and Rajiv Gandhi for not using his 400-MP majority to push through an agenda of a gender-sensitive civil code. Ram Guha: My response has already been indicated. Globally Islamic fundamentalism is a threat. In India because Hindus comprise more than 80 per cent of the population and records of communal riots show that Muslims suffer disproportionately in terms of loss of lives, houses burnt and women violated, I - as a Hindu - stand against Hindu fundamentalism. Of course, I would criticise Islamic fundamentalism too . and globally, that is a much greater threat - but in India, the objective reality is that Hindu fundamentalists pose a much greater threat to the inclusive ideals of the Constitution. That is not because they are wicked people, not because their ideology is worse than other radical elements but simply because on Indian soil they outnumber Islamic fundamentalists by about 7 or 8:1. That is just a statistical fact. For that reason, people like me will always have more to say about Hindu fundamentalism.